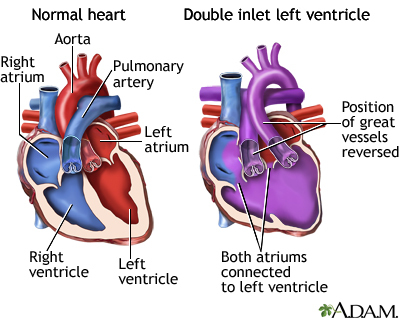 Double inlet left ventricle (DILV) is a heart defect that is present from birth (congenital). It affects the valves and chambers of the heart. Babies born with this condition have only one working pumping chamber (ventricle) in their heart. DILV is one of several heart defects known as single (or common) ventricle defects. People with DILV have a large left ventricle and a small right ventricle. The left ventricle is the pumping chamber of the heart that sends oxygen-rich blood to the body. The right ventricle is the pumping chamber that sends oxygen-poor blood to the lungs. In the normal heart, the right and left ventricles receive blood from the right and left atria. The atria are upper chambers of the heart. Oxygen-poor blood returning from the body flows to the right atrium and right ventricle. The right ventricle then pumps blood to the pulmonary artery. This is the blood vessel that carries blood to the lungs to pick up oxygen. Blood with fresh oxygen returns to the left atrium and left ventricle. The aorta then carries oxygen-rich blood to the rest of the body from the left ventricle. The aorta is the major artery leading out of the heart. In people with DILV, only the left ventricle is developed. Both atria empty blood into this ventricle. This means that oxygen-rich blood mixes with oxygen-poor blood. The mixture is then pumped to both the body and the lungs. DILV can happen if the large blood vessels arising from the heart are in the wrong positions. The aorta arises from the small right ventricle and the pulmonary artery arises from the left ventricle. It can also occur when the arteries are in normal positions and arise from the usual ventricles. In this case, blood flows from the left to right ventricle through a hole between the chambers called a ventricular septal defect (VSD). Surgery is needed to improve blood circulation through the body and into the lungs. The most common surgeries to treat DILV are a series of two to three operations. These surgeries are similar to the ones used to treat hypoplastic left heart syndrome and tricuspid atresia. The first surgery may be needed when the baby is only a few days old. In most cases, the baby can go home from the hospital afterward. The child will most often need to take medicines every day and be closely followed by a pediatric heart doctor (cardiologist). The child’s doctor will determine when the second stage of surgery should be done. The next surgery (or first surgery, if the baby didn’t need a procedure as a newborn) is called the bidirectional Glenn shunt or Hemifontan procedure. This surgery is usually done when the child is 4 to 6 months old. Even after the above operations, the child may still look blue (cyanotic). The final step is called the Fontan procedure. This surgery is most often done when the child is 18 months to 3 years old. After this final step, the baby is no longer blue. The Fontan operation does not create normal circulation in the body. But, it does improve blood flow enough for the child to live and grow. A child may need more surgeries for other defects or to extend survival while waiting for the Fontan procedure. A heart transplant may be recommended, if the above methods fail. The baby’s overall condition at the time of diagnosis and treatment. If there are other heart problems. How severe the defect is. After treatment, many infants with DILV live to be adults. But, they will require lifelong follow-ups. They may also face complications and may have to limit their physical activities. Also talk to your provider if your baby is not growing or gaining weight. Jacobs ML. The functionally univentricular heart and Fontan's operation. In: Mavroudis C, Backer C, eds. Pediatric Cardiac Surgery. 4th ed. Oxford, UK: Wiley-Blackwell; 2013;chap 28. Kanter KR. Management of single ventricle and cavopulmonary connections. In: Sellke FW, del Nido PJ, Swanson SJ, eds. Sabiston and Spencer Surgery of the Chest. 9th ed. Philadelphia, PA: Elsevier; 2016:chap 129. Kliegman RM, Stanton BF, St. Geme JW, Schor NF. Cyanotic congenital heart disease: lesions associated with increased pulmonary blood flow. In: Kliegman RM, Stanton BF, St. Geme JW, Schor NF, eds. Nelson Textbook of Pediatrics. 20th ed. Philadelphia, PA: Elsevier; 2016:chap 431. In double inlet left ventricle only the left lower heart chamber (left ventricle) is developed, and both upper chambers carry blood into this ventricle. A small, poorly developed right ventricle may be present. Double inlet left ventricle is one of several heart defects known as single (or common) ventricle defects, as there is essentially only one pumping chamber in the heart.